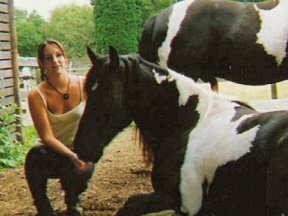 The Equine Reiki training courses are presented by Vicky and Sarah Berrisford; both are Professional Horse Trainers, BHS Stage 3 and Reiki Master/ Teachers. The Equine Reiki Master Practitioner Course is open to students who have completed Reiki 2 (Okuden) in Reiki and who have also taken the Equine Reiki practitioner course Levels 1 and 2. We have a fabulous set up here in Lincolnshire, using a selection of equines from our stud, training yard and livery. This variety of horses makes our equine course available to anyone, inexperienced or professional, who wishes to learn and practice the techniques that I have found most appropriate when working with Reiki for horses. In this course we work on further developing our sensitivity and intuition and have the use of new exercises which are primarily aimed at horses which have been through traumatic ordeals and/or have severe emotional issues which are affecting their quality of life. We delve into the practices of visualisation, intuition and intent to a high degree. We start day 1 with the exercise ‘clearing your mind.’ It can take some practice to completely clear your mind, without visualising anything, just being there in the moment and open. This exercise is of great importance during our work with Reiki and horses as it is from this state that we can begin to further see, feel and hear what the horse wishes to portray. Working with the aura is greatly emphasised on this course; not only being able to perceive and empower the horses aura, but to become aware of how our aura is reacting to situations. With practice we can notice if our aura deflates or shines in the company of others, we can read clients and friends auras, by asking questions and seeing how the aura responds we can get a fuller picture of what is going on. In relation to giving Equine Reiki treatments we are able to see how the owner and their horse’s aura interact. We learn to calm the aura in cases where the horse is excitable, nervous or stressed and we learn to empower the aura where the horses energy is depleted. As with the ‘human’ Master Reiki course, you are introduced to the power of the kotodoma; the sacred sounds. Using the kotodoma to calm, heal, empower and balance the horse. The kotodoma seem to elicit stronger energy to the horse and the horse listens with familiarity to the sounds. At the end of the 1st day we put into practice an adapted empowerment technique for horses that Sarah was guided to. The empowerment process for horses can aid the connection between horse and owner, where the owner is affecting the horses energy in a negative way and the horse needs time to recover, we can empower the horse to help him regain his energy and to keep him balanced when those around him are not. On the 2nd day of the course we start with a Master Empowerment and then go on to a practical exercise of becoming the horse. You learn how to go inside the horse to feel as he does, this can help in many circumstances, for instance with horses who are nervous when entering the stable or won’t load, you can become the horse and feel how he does in the situation; you can feel the parts of his body that tense and send a trigger response to the brain, from this you are able to send Reiki not only to the circumstances where the horse is afraid but to the parts of his body that cause him to feel anxious. Animal Communication is also featured on this course; with the previous exercises communication often comes into the equation, however, we also practice Distant Communication; this will enable you to provide Distant Healing and Communication as part of your services to clients. Students are invited to bring a picture of their horse or animal to gain feedback from other course participants or they can use a picture provided by Sarah Berrisford. Another symbol; The Heart Chakra Symbol is also used on the Master Equine Reiki Practitioner Course, this deals directly with emotions and can go deeply into a rooted emotional problem. We work with the Heart Chakra Symbol in the same ways as CKR and SHK, using Reiju Ho and intuition. After lunch on the 2nd day we visit a nearby yard (transport provided). Students will each have their own horse to work on and after the treatment will exchange feedback with the owner who will be on-site and knows most of the history on all of her horses. This is a great chance for students to work on horses they have not met before, not only using the techniques they have learnt during the course but also giving and receiving feedback to the owner on what they have felt. The course consists of 2 full days from 10am – 5pm. The number of students is limited to 5. Throughout all of the courses at Epona Equine Reiki Centre we work on a practical basis; working on the horses 1:1 and giving you as much practical experience as possible. 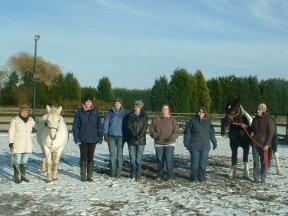 Epona Equine Reiki Centre is set in the picturesque village of Gedney Hill in Lincolnshire. We are situated directly opposite ‘North View Fishing Lakes’ which is adjacent to Monkwise Golf Course. 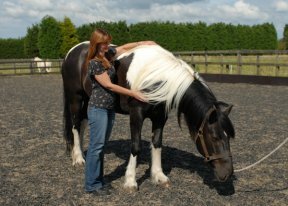 The fee for the Equine Reiki Master Practitioner Course is £351, with a £66 deposit paid in advance, and the balance paid to Sarah Berrisford on the day of your course. Once you’ve been on your Equine Reiki course we want you to know that your teacher will be on hand to deal with any questions or queries that you might have at any point in the future. After completing any of the courses at Epona Equine Reiki Centre, Sarah invites you to join the Epona Equine Reiki website; promoting your Equine Reiki services, free of charge.